Many antique and old samplers have been dedicated to Adam & Eve and the Tree of Life. Caroline Reeves stitched her sampler in 1830, probably in Pennsylvania, and Becky deVries-Wong owns this sampler in her private collection of antique needleworks. Becky is also one of the two owners of “In The Company of Friends”, together with Julie Buck. 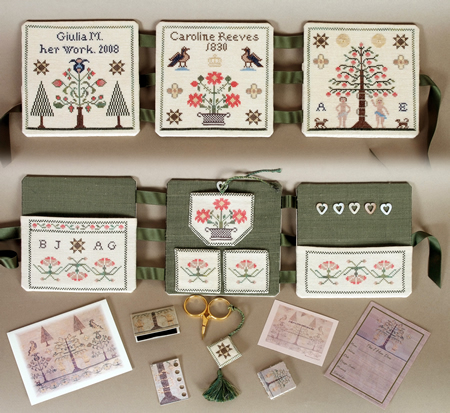 They have reproduced several sections of Caroline Reeves sampler to create lovely cards, labels, bookplates, needlebook, thread keeper and pinkeep. I happened to browse their beautiful website and find the Adam & Eve Set of stitcher’s accessories. It was love at first sight! I asked Becky and Julie permission to create something inspired by their set, obviously reproducing some motives, even though with different colours and different placement on fabric. I wanted a special etui to hold all the reproduction accessories. List of finishing materials to purchase: cardboard or mat board such as is used in picture framing, Dupioni silk, green polyester ribbon 5/8 in / 1.6 cm wide, interfacing, a small piece of ecru wool felt, six mother of pearl heart rings by Kelmscott Designs, acid free stick glue or fabric glue like Tacky glue, green and ecru sewing thread, Fray Check or Fray stop or any other no-fray medium. Adam & Eve Stitcher’s Set: cards, bookplates, needle book, pinkeep, threads keeper and adhesive labels by In The Company of Friends. Seaton scissors by Kelmscott Designs. Chart pack includes designs charts and instructions for stitching and finishing the etui. Stitches Cross stitch over two, Back stitch, Eyelet Stitch, Diagonal Eyelet Stitch, Satin Stitch, Smyrna Stitch.